We’re pleased to share our standard catering menu options below. Remember, we have many more recipes and ideas available! Our box lunches include sandwich, chips, fruit, dessert and drink; Salads include bread/muffin, dessert & drink. Prices: $7.50 per box. Sandwiches or salads are available on large trays by request. Roast Beef, Turkey or Ham with cheese, lettuce tomato on your choice of bread. Tuna or Chicken Salad with tomato & lettuce on your choice of bread. Vegetarian Sandwich – cucumbers, tomatoes, sprouts, avocado, peppers, onions with vegetarian cheese, on a multigrain bread. Choice of Breads are: Croissant, Kaiser rolls, Hoagie, Multigrain bread, Marble and Thin Bagel bread and Flat Round Bread. Southwest Chicken Wrap – Chicken, lettuce, tomatoes, olives with southwest ranch dressing and cheese, served with salsa. Gourmet Beef & Cheddar Wrap – Beef, cheddar cheese, chopped lettuce with Dijon mustard sauce. Our Signature “Strawberry Walnut Salad”, made with romaine lettuce, fresh strawberries, walnuts, jack cheese and chicken with a red wine vinaigrette dressing. Taco Salad, iceberg and romaine lettuce, seasoned chicken, black olives, tomatoes, shredded cheese, sour cream and guacamole with salsa and tortilla chips on the side. Greek Salad, romaine lettuce, feta cheese, Greek olives, purple onion, tomatoes, pepperoncini and chicken. With Greek salad dressing. Chef Salad, mixed spring greens and romaine lettuce, turkey, ham, cheese, hardboiled eggs, cucumbers and tomatoes. With Ranch or Italian dressings. Spinach Salad, fresh spinach leaves, chicken, mandarin oranges, sliced almonds. With a raspberry vinaigrette dressing. Grilled Chicken Caesar Salad, grilled chicken breast, romaine lettuce, shredded parmesan, tomatoes and red onion served with classic Caesar dressing. Bagels with cream cheese and Assorted Muffins. Fresh Fruit: served on trays/bowls or kabobs served on skewers displayed in ½ of a watermelon. Breakfast Burrito with salsa on the side. Prices vary depending on selection. Served with Ice Tea & Coffee (Soda extra) And don’t forget dessert! Assorted Cookies or Bars. Our prices start at $10.00 for a selection of 4 appetizers (two meat items and two other), minimum of 25 please. Spinach Artichoke Dip served with bagel chips. Smokey Wrap: little smokies wrapped in bacon, marinated with our special rub and baked. Served hot with toothpicks. Italian Meat Balls: sweet and spicy meatballs. Pizza Dip: Spicy pepperoni with cream cheese, sour cream and pizza sauce, served with pita chips. Quiches: Bite size ham & cheese and spinach. Spicy Mexican Cheese Dip: Hot creamy cheese with rotel tomatoes and hamburger. Served with Tortilla Chips. Assorted Meat & Cheese Tray served with dollar rolls. Fresh Veggie Tray: Carrots, Celery, Tomatoes, Cucumber, red & green peppers, served with ranch dressing. Veggie Bars – crescent roll crust with ranch cream cheese, chopped veggies topped with cheese. Our Signature “Rich chocolate brownie” with creamy peanut butter icing. Mini éclairs, cream puffs and assorted cheese cake bites. Our buffet pricing includes an Entree, served with three sides and a dessert of your choice, dinner rolls with butter, iced tea and coffee. Please select from the choices below or contact us with any custom requests. Please call if you are interested in pricing for desserts only. We have many more recipes and ideas available. Whether you would like to cut down to save money or to dress it up to have a more elegant affair we can do it! 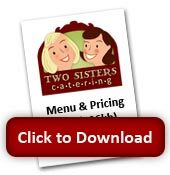 Our Goal is to make the “catered” portion of your event run smoothly and taste wonderful. We look forward to the pleasure of serving you!